inspiring programs and workshops for audiences and students of all ages. Left: The Wingra Wind Quintet performs for students in northern Wisconsin. Center: Students from Milwaukee High School for the Arts at the Humanities Building for a rehearsal. Right: Suzanne Beia coaches a string quartet from the Milwaukee High School for the Arts. A component of the University of Wisconsin–Madison School of Music, the Music Engagement and Outreach Program shares the expertise of its three faculty ensembles‐in‐residence with young musicians and community audiences around the state. Comprising world-renowned performers and educators, the Pro Arte Quartet, Wingra Wind Quintet, and Wisconsin Brass Quintet bring their experience and musical mastery beyond the University walls. Each ensemble travels throughout Wisconsin to high schools, colleges, and concert halls, working with young musicians and performing for local concert series patrons. With generous support from the Reilly Baldwin Wisconsin Idea Grant, the Music Engagement and Outreach Program continues to expand its involvement with Wisconsin communities by providing mentoring, educational leadership, and training opportunities to students of all ages and backgrounds. In 2016, the University of Wisconsin-Madison Mead Witter School of Music began an ongoing residency program at the Milwaukee High School of the Arts, a public arts magnet high school. 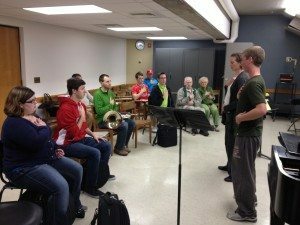 Students in the MHSA Band, Orchestra, and Jazz ensembles worked side-by-side with the Pro Arte Quartet, Wingra Wind Quintet, and Wisconsin Brass Quintet both at MHSA and on campus at UW-Madison during its inaugural year, and the program has since expanded to include the vocal program at MHSA and its drumline. During the 2018-19 academic year, the partnership will focus on MHSA’s robust choral and opera programs, with collaborations involving UW-Madison choral, opera, and applied voice faculty. 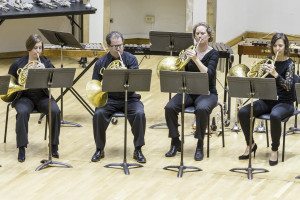 The ensemble will perform pieces or excerpts of pieces from their repertoire, then discuss and analyze the music from the ensemble’s unique approach to performance. Questions to and from the audience will be addressed throughout the demonstration. Members from the ensemble will listen to solo or small ensemble performances and offer comments and suggestions. Groups of any instrumentation playing music from any era are welcome! Students and/or public audiences are invited to observe. Members of the ensemble will lead auditors through a public rehearsal of current repertoire. Repertoire for the class will be chosen by the ensemble. Questions from the audience will be addressed throughout the rehearsal. Private coaching of small chamber ensembles can be most beneficial when preparing for an upcoming performance, such as Solo & Ensemble. The UW Faculty Ensemble will split up so that one individual will coach one ensembles. Coaches will discuss specific techniques, performance practices, and develop musical ideas with the ensemble. All levels welcome! The ensemble will rehearse with and prepare work(s) to be performed alongside a student ensemble. Side-by-side performances typically take 1-2 rehearsals. Repertoire varies depending on ensemble and ability level of collaborators. A full clinic may include a combination of any of the educational workshop offerings. Full/half-day clinic costs vary depending on length of clinic. The concert was exquisite. To have this level of professionalism, talent and experience in our little theater was magical. It was a truly unforgettable experience. The audience was thrilled. This was a record-breaker for sales…everything was terrific, extremely well organized…the group was friendly and accommodating…Your Arts Outreach is a flagship program, where you truly “walk the talk” of the Wisconsin Idea. We were honored to have the musicians here. One of the things that is so great about having these groups…is that they are polished teachers. They understood how to communicate to young people and share their musical expertise in a very relatable way… universal to all players. As far as the work that the Outreach program is doing, I think it is phenomenal.